Dermatitis is an aggravating skin condition that results from inflammation. In its mildest form, it presents as dry, itchy skin; in more severe cases, symptoms can include crusty scales and oozing blisters. Mild dermatitis is usually first treated at home with over-the-counter creams to relieve itching and moisturizers for dryness. If your symptoms continue or begin to worsen, you may want to stop in at your local FastMed Urgent Care clinic. Though most people believe they need to go to a dermatologist, common dermatitis can be seen by FastMed Urgent Care professionals at a time that’s convenient for you. We’re open every day, so you don’t have to make an appointment or take time off. We accept most major insurance plans and have a discount program to help people without insurance manage their healthcare costs. The first step in treating dermatitis is determining what type of dermatitis you have. FastMed medical professionals will evaluate your symptoms, conduct appropriate tests, and move forward with a treatment plan. 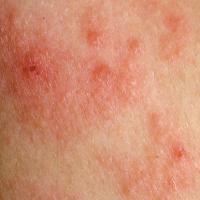 Contact Dermatitus: This is normally the result of coming in contact with a skin irritant. It can also be an allergic reaction. Atopic Dermatitus: This is better known as eczema and generally runs in families. The skin gets itchy, irritated and sometimes blisters. Nummular Dermatitis: ﻿This is more common in men, particularly men over 55. It manifests with large red coin shaped blotches usually on the arms and legs. Seborrheic Dermatitis: ﻿ In babies, this is called cradle cap: greasy yellowish scaling around the scalp and eyes. In adults, the condition becomes dandruff. Topical corticosteroid creams may be prescribed, or an antihistamine may be recommended to relieve itching. If scratching has resulted in a sign of secondary infection, you may also need antibiotics. In extreme cases, it may be necessary to consider corticosteroid pills or injections. Your FastMed medical team will discuss all the options so that you can make an informed decision when moving forward. Try to stay hydrated and avoid scratching as much as you can. We’re here if you need us – 365 days of the year.